The son of Grand Prince Yaroslav II of Vladimir, St. Alexander Nevski is a hero who defended Russia against the Swedes and the Germans. He is also an enigma, being the conciliatory to the Mongols. 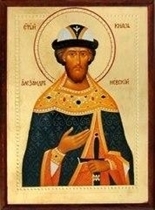 Born c. 1220, Alexander was elected Grand Prince of Novgorod in 1236. Married three years later, he defeated the Swedes at the confluence of the Ithara and Neva Rivers in 1240, and from this victory, he earned the name "Nevski." Two years later, he routed the Teutonic Knights, whom Pope Gregory IX had commissioned to christianize the Baltic. Alexander was also victorious over the Lithuanians and the Finns. On the death of his father in 1246 Alexander and his brother, Andrew, struggled briefly for the throne. The Great Khan appointed Alexander - Prince of Kiev, and Andrew - Prince of Vladimir. Alexander also became Prince of Vladimir in 1252, when he revealed his brother Andrew's plans for a revolt to the Mongols. Alexander continued to control Novgorod through his son, Vassily, and ended the election of princes in that city. In 1255, Alexander quelled a rebellion against Vassily, and in 1257, he put down a rebellion against the Mongols. His relationship with the Golden Horde is thought to have protected the Russian people from the usual ravages of Mongol occupation, and in 1262, at his request, the Mongols exempted Russians from their draft. Alexander died in 1263 in Gorodets.